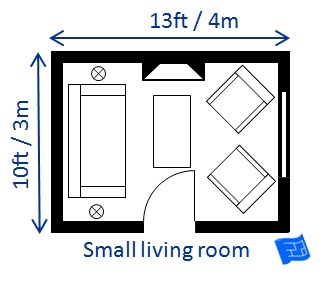 So let's have a look at some living room sizes. We go from very small through to large. 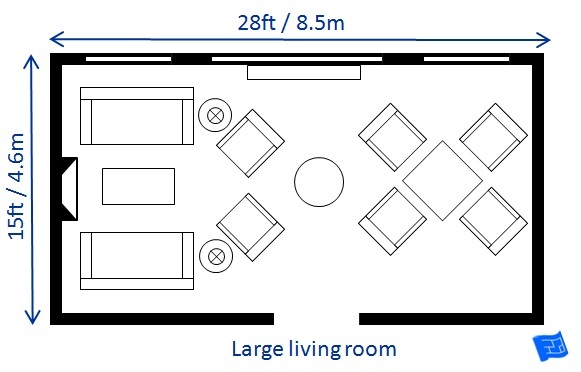 For each living room size I've taken into account a conversation area (a square conversation space) and an extra 3ft (0.9m) for circulation. All the dimensions I talk about are for a rectangular shaped room. If the living room has an interesting shape there will be room for other activity areas - there's lots of things you can use your living room for. You might also like the living room layout page. 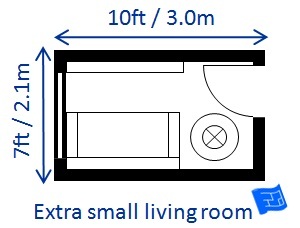 You can fit a very small living room into a 7 x 10ft (about 2.1 x 3.0m) space. 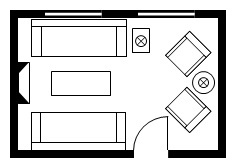 This would be a tiny room and would only really allow a small 2-seater sofa on one side of the room in the layout. But if there's only 2 or 3 of you then this can work well in a small space. A space of about 10 x 13ft (about 3 x 4m) would be the next size up. 4 or 5 people could be seated on a 2-seater sofa and chairs (or 2 2-seater sofas). This arrangement would allow 2 or 3 people to watch TV comfortably if it was mounted on the wall behind the sofa. 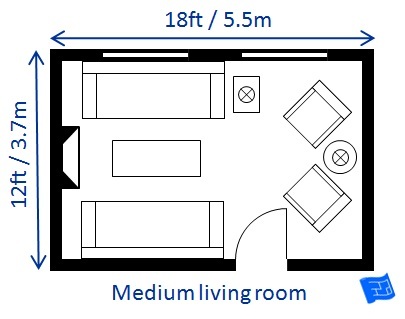 A space of 12 x 18 ft (about 3.7 x 5.5m) would fit between 6 and 10 people in a conversation area with about 5 of the seats facing the TV (TV would be better placed in a corner on the fireplace wall than above the fireplace). There's room for 3-seater sofas in medium sized living rooms. To seat 10 people you'd have to have the conversation area on all 4 walls of the living room. If you're lucky enough to have a living room size with dimensions larger than 15 x 20ft (4.6 x 6.0m) then there is the possibility of bringing the sofas away from the walls, having deeper, more luxurious sofas and creating secondary furniture groupings. Take a look at the living room layout page to see some of the possibilities. In a large living room it is better to add additional furniture or seating, (eg games table or writing desk) rather than increasing the distance between your seating and making the conversation area uncomfortably large. The arrangement above right has a main seating area in the background. A table and sideboard on the central axis of the room create a logical division in the space and add focal points. The remaining space is furnished with a games table grouping. If people are standing chatting – the typical drinks party scenario – each person will take up about 12sqft. That’s the size recommended by the ‘events’ profession for standing events. If people are more densely packed in than this is will start to feel crowded – but hey that adds atmosphere – and there’s always the kitchen!